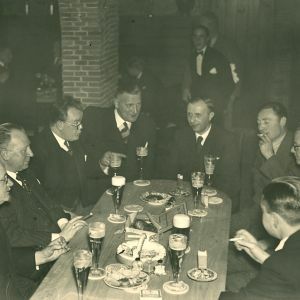 In his speech to celebrate the opening of the new brewery in 1937, Guus Brand said: “Over a 100 years the brewery installation will be old fashioned but the “kelderke” will still witness the flourishing of the Limburg artists.” How correct were these wise words 75 years later! 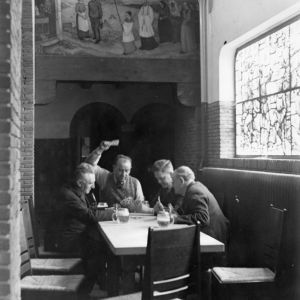 The brewery has made many changes, however the visitors reception area of the Brand Brewery in Wijlre ’t Kelderke” as it is known, has not changed at all and is still the main attraction of the visit to the brewery. ‘t Kelderke was built by the architect Jos Wielders (1883-1949) from Sittard who built many churches in Limburg. The wall paintings in ‘t Kelderke is typical idyllic Limburgs scenes made by Harry Koolen from Meerssen (1904-1985). 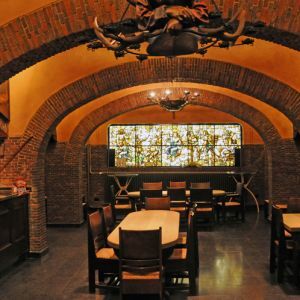 Henri Schoonbrood (1898-1972) from Maastricht developed the stainglass window representing the pleasure of drinking beer. Jan van Puyenbroek (1987-1972) who came to Meerssen in Limburg from Antwerp during the First World War, coached both artists. 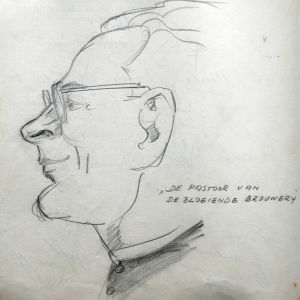 Artists continued to have good relations with Brand and they visited the brewery and ‘t Kelderke many times. This can be seen in the ‘Kelderke visitor’s book which dates from 1937 and visits continued also during the war. 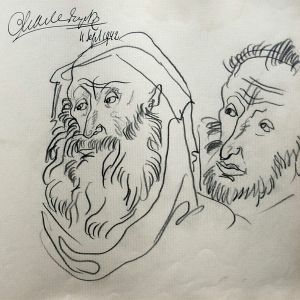 In this visitors book there are many beautiful drawings from Charles Eyck from September 1942. Charles Eyck (1897-1983) was born in Meerssen and he was part of the “Meersense School” from Jan van Puyenbroek. 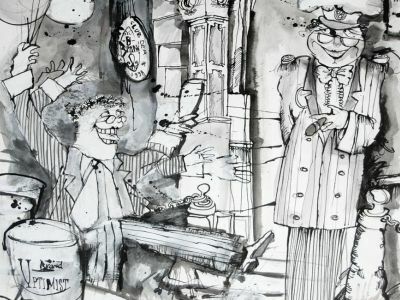 He went to Art school in Amsterdam with Harry Koolen. 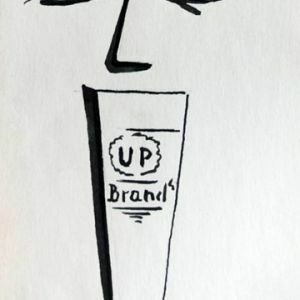 In the 1950’s, he made a drawing for Brand for the Brand Up ’52 advertisement, ‘The beer of the Uptimists’. In addition, the middle Limburg’s art circle “Remunji” visited the brewery. 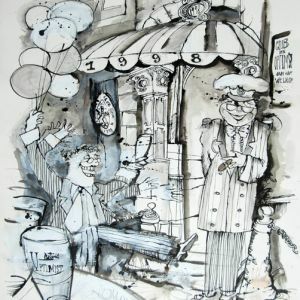 On 5TH October, 1953 they gave Brand a bundle of drawings as a token of their visit. 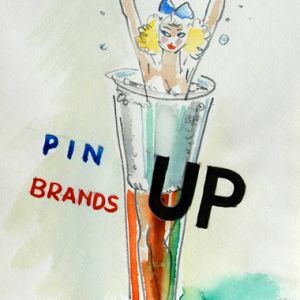 In 2000, Brand initiated a well-known campaign with a number of artists. This time it was not the decoration of an interior, but the work was rather diverse using modern technology. 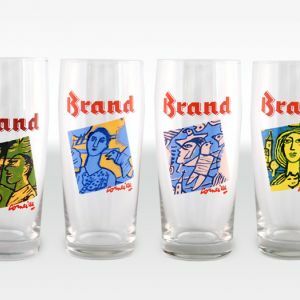 Instead of using local Limburg’s artists, as in 1937, Brand engaged international artists to reach a broader public. Art on Cans’ was the name of the campaign. 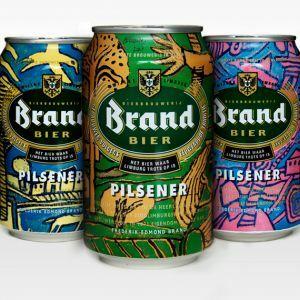 A website with this name was launched and two artists given the assignment to develop Brand cans. In 2000, the cans of Rob Scholte (born 1958) appeared with the theme earth, wind, water and fire. Rob Scholte is known to many people due to the bomb blast he survived when he got into his car in Amsterdam. He lost both legs and is now in a wheel chair. In 2001, Corneille (1922-2010) came with the 4 seasons decorated cans. In addition, other artists, including the Amsterdam painter Peter Klashorst (born 1957) got the assignment to paint a large canvas 2 x 6 metres. These canvases decorated the Brand beer trucks, which travelled the width and breadth of the country. Everyone in the Netherlands was involved with this campaign; via the website and via the Brand Noordwijk Painters festival held in 2001. 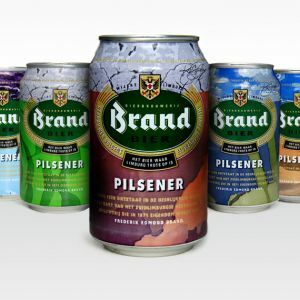 With the ‘Art on Cans’ campaign Brand wanted to communicate what they stood for; quality, tradition and “styleful enjoyment”. 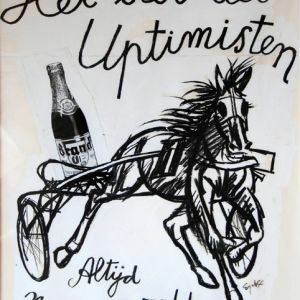 In fact this is also exactly what Guus Brand, in 1937, wanted to show in the visitors reception area in the brewery. 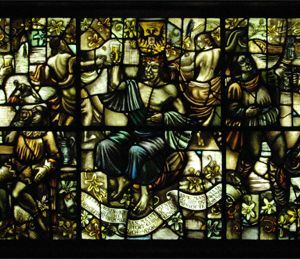 The saying on the stainglass window, from 1937, is still actual: ‘Playing card, stocking and jug makes many poor men, but enjoyed responsibly, you have no need to be ashamed of any person’.